As per Chitika (advertising network), Android users are 80% more valuable than iPhone, i.e. higher CTR on Android devices than iPhone. 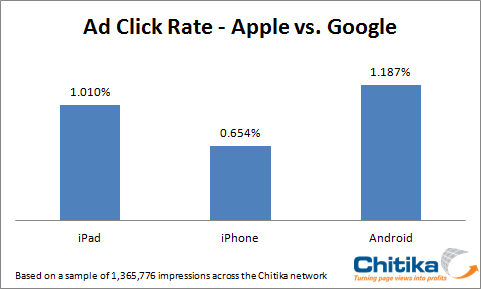 Online ad network Chitika looked at ad click rates across its network for the two devices and came to the conclusion that Android users are by far more valuable individually than iPhone users – people on the Android OS clicked on ads 81% more often than people on the iPhone [source]. A possible reason, Chitika cites could be because of the difference in display size. Android devices, however, by and large have similar screens to the iPhone, and Chitika’s advertisements display the same on both devices. According to Nielsen, African-Americans use the most voice minutes – on average more than 1,300 a month. Hispanics are the next most talkative group, chatting an average of 826 minutes a month. Even Asians/Pacific Islanders, with 692 average monthly minutes, talk more than Whites, who use roughly 647 voice minutes a month. Download Firefox 4 Beta from here. The deal is done and transition is done. Yahoo! is done with transitioning the search results backend to Microsoft. End of Y! Search game.